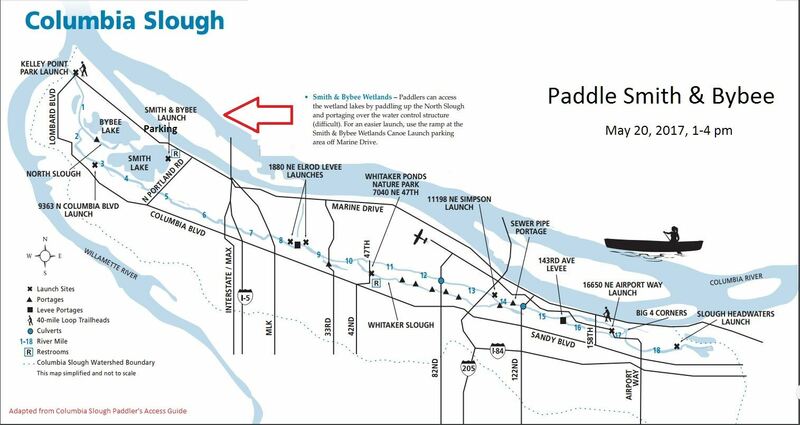 Grab your gear and join us for a Kayak / Canoe trip on Smith and Bybee Lakes in North Portland. Joining us to guide us on our float will be volunteer Troy Clark and Volunteer Coordinator, Kelsie Greer of the Columbia Slough Watershed Council. Smith and Bybee make up only a fraction of the floatable waters in the tidally influenced Columbia Slough, so we are so pleased to have some experts along to get us acquainted. We hope you will join your fellow OLA members for this introduction to this unique natural area which surrounds the Portland Metro Area. Don't have a kayak of your own, check out a list of local rental opportunities below. Event is open to all members of the Oregon Lakes Association and a guest, but is limited to 25 in total, so RSVP today. In order to support the watershed council and provide OLA a little fundraiser as well we are charging a modest $10 per participant for this member's only event. Funds will be split equally between the two organizations. Please note that by registering, you and any guests accept the risk and personal liability associated with this activity. You also commit to supplying your own gear (e.g. Kayak, Paddle, PDF, Whistle, Water, Snacks, etc.) and will have a current Oregon Aquatic Invasive Species Permit for any vessel 10' in length or greater. Directions: From I-5, exit 307 onto Marine Drive West. Travel approximately 3 miles. You will see a sign on your left to marking the entrance to the wildlife area. Turn here and follow this road past the main parking area to the end to reach the foot path to the launch. Parking, Restrooms, & the Launch: The kayak launch is at the end of the ~ 100m long trail (longer in dry times) and can be a bit muddy. Please be prepared to carry your vessel down this path. There are a few spots to park here, but we may have to move a few vehicles back to the main parking area where the restrooms are located. Regulations: This is a natural area administered by Metro. There are no fees at this facility, but please note that dogs and other pets are not allowed in this natural area, so even if you have a water dog, please leave them at home. Basics and Extras: Here are a few links to get you acquainted with the area and to help you get ready to Paddle Smith and Bybee ~ Float On!